Red Bull Racing introduced their Adrian Newey-designed 2015 Formula 1 chassis with a mirage livery designed to disguise the body lines, ducts, wings, and all other manner of aerodynamic features. Luckily, some camouflage just cant match a good eye, and we can reveal some of the larger aerodynamic concepts of the RB11. My drawing may not be as detailed as Craig Scarborough's, but the main features can be clearly seen. As Scarbs mentions in the video, Red Bull are mostly trying to disguise their clean body lines and quite extreme sidepod undercuts. However, the Milton Keynes-based team is surprisingly behind the aerodynamic curve by not integrating a "floating gearbox" in testing, but no doubt they are aware of what McLaren and Mercedes are running and will look into the advantages of lifting their Renault-mated gearbox above the floor before McLaren-Honda are on pace. Red Bull have been using an S-Duct for a few years now. An S-Duct takes the air from underneath the chassis and dumps it on top to create a boundary layer of air between the chassis and the normal airflow, thus allowing cleaner airflow of the normal air. The duct is named after the "S" shape that takes the air from underneath and dumps it on top (backwards "S" from this perspective). The S-Duct was first used by Sauber to discourage the negative effects of the stepped noses a few years back, and now it is being used by Force India as well as Red Bull in 2015 to overcome the same sort of effect of the lower noses. 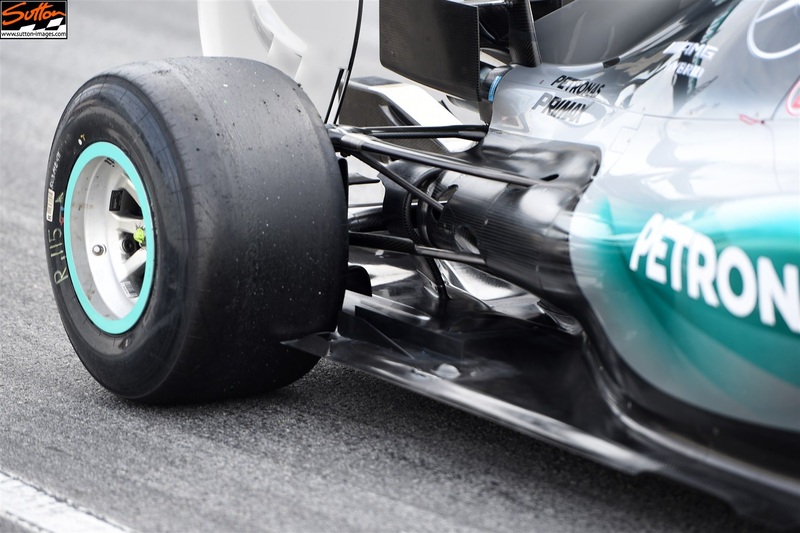 Red Bull, Ferrari, and McLaren have all made the decision to add blown front wheels to their 2015 cars. Blown front wheels use the airflow coming from a large brake duct inboard of the wheel and routes the air through the hub of the wheel and outboard through the wheel nut. A blown front wheel is used for a few things including: increasing the outwash initiated by the front wing around the front tire, cleaning up the airflow from the wake of the front tire heading toward the coke-bottle zone, and reducing the air turbulence from the spinning wheel. Red Bull have been arguably the most ambitious team with cooling in 2015. Their sidepod inlets are the smallest down the grid, and the undercut of said inlets are high to aid airflow back to the diffuser. Other than the sidepods, Red Bull have only 2 other cooling inlets, both just above and behind the driver. The lower of the two looked as though it was not getting any air, so the boffins at Red Bull tested Ricciardo's helmet with flow vis paint and discovered the winglet, used to negate helmet lift, on the back of Ricciardo's helmet was blocking the airflow, so it has now been removed. Moving to the rear of the chassis, Red Bull have shrink wrapped their cooling exits around the engine exhaust, most of the exiting airflow stretched out to the lower sides of the exhaust, still leaving plenty of room below for the coke-bottle airflow to pass over the diffuser; Lotus and Mercedes have also been seen utilizing this cooling trend. Want to hang this RB11 on your wall?